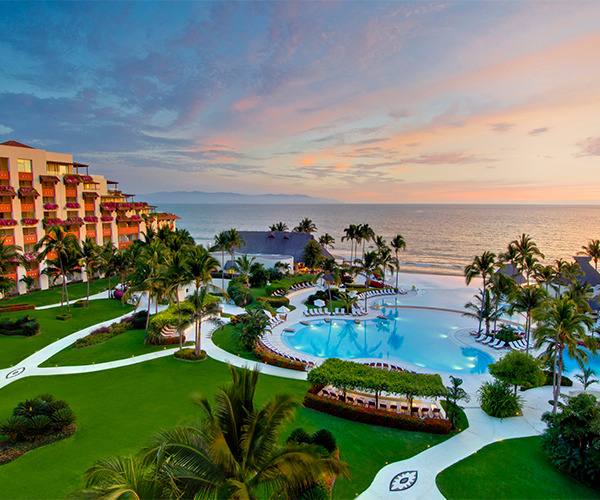 Grand Velas Riviera Nayarit is a luxury All-Inclusive resort on the Pacific Coast of Mexico, surrounded by the blue waters of Banderas Bay, long sandy beaches, Sierra Madre Mountains and green fairways. Having revolutionized the All-Inclusive concept, the resort offers a"Beyond All-Inclusive, Beyond All Compare®" vacation experience with exceptional dining, exquisite suites, lavish service and a full range of first-class amenities and special details. Join us to embrace the radiant sunsets and rhythms of the ocean, as you revel in the spirit of Mexico. Located just 15 minutes from the Puerto Vallarta International Airport, the resort is edged by more than 650 feet of pristine beach and features a three-tiered infinity pool overlooking the ocean. Awarded Five Diamonds by the AAA, it offers gourmet dining in five restaurants, 24/7 in-suite dining, spectacular ocean and pool views, personalized service, luxury amenities and facilities including modern Kids’ and Teens’ Clubs, a 16,000-square foot luxury Spa, oceanfront gazebo for weddings, and professional meeting spaces. Guests select from 267 ample suites with garden, pool and ocean views, and categories including Master, Parlor, one-bedroom Governor, Wellness, Grand Class, two-bedroom Family Suites, Presidential and Imperial Spa Suites. The entire experience is enhanced by an ideal location for activities such as golf, deep sea fishing and scuba diving. Nestled along the northern edge of Banderas Bay, Grand Velas Riviera Nayarit enjoys the tranquility of the Riviera Nayarit's beautiful waterways, pristine sandy beaches, championship golf courses, deep blue Mexican Pacific and majestic Sierra Madre Mountains. Just 15 minutes from the Marina Vallarta and the Puerto Vallarta International Airport, and 30 minutes to historic downtown Puerto Vallarta and El Malecón, the resort offers the perfect location for relaxation, fun and exclusive activities. The path to transformation. 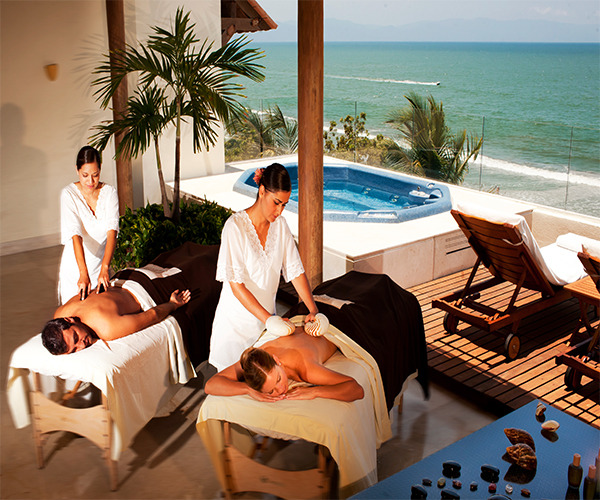 Conscious of the perpetual search for wellbeing and the constant energy changes that human beings undergo, SE Spa at Grand Velas Riviera Nayarit has created a selection of treatments focused on achieving a genuine transformation and deep relaxation. The true metamorphosis of a human being is related to the reconnection with the authentic inner self. It means recuperating the brightness of the spirit, the vitality of the body and the freedom of the mind. The change may be gradual or immediate, but it is always a process of transformation experienced from within. Hours: 8:00 a.m. to 8:00 p.m.
MASSAGES: The path to wellbeing. If the body requests it, the interior needs it. HARMONIZING THERAPIES: The path of healing. Finding inner balance. FLAVORS AND TRADITIONS OF MEXICO: The path to wisdom... it lives within each of us, in our ki-kupur soul that connects us to the strength of life. BODY TREATMENTS: The path to renovation. Allow the skin to breathe as well. FACIALS: The path to illumination. Care for the frame that displays our soul. RITUALS: The path to transformation. Pampering your body and caressing your senses. BEAUTY SALON: The path to beauty... encouraged by a positive attitude. KIDS’ TREATMENTS: The path of purity. The transformation starts at an early age. TEENS’ TREATMENTS: The path to vitality. Adolescence is the most representative stage of the transformation of our children. FITNESS CENTER: Hours: 6:00 a.m. to 9:00 p.m.
Our high-performance fitness center is equipped with cardiovascular equipment, including treadmills, stair climbers, elliptical trainers and bikes, as well as resistance and weight training machines. The waterfront property offers an amazing variety of sports and activities for adults and children. Children ages 4 to 12 have scheduled outdoor and indoor activities—cooking classes, rock painting, football, and aquatic volleyball are just a few—as well as a playground and pool of their own. Yoga, Pilates, aerobics, step classes, flex ball, and salsa classes—not to mention a gym equipped with weight training, treadmills, stationary cardio climbers, cross trainers, and bikes—give everyone an option for exercise. There is also an art and ceramic workshop for a little right brain workout. Two courses, El Tigre and La Vista, are nearby for golf enthusiasts. Designed by the renowned architecture firm Elias & Elias, all of the 267 rooms and suites have ocean views, and most are large enough to accommodate a family of six. Hi-speed Internet access and cable TV with video consoles keep both business travelers and children satisfied. Spa massages are available in-room, but must be booked in advance. Room service is available 24 hours, and four world-class restaurants offer many options. Azul offers oceanfront dining and an international menu of Chinese, Italian, Japanese, and Mexican cuisines, along with a special spa menu for breakfast, lunch, and dinner. Featured items include seasonal tropical fruits and frappe drinks for breakfast, (try the Nayarit citrus blend, to get a taste of locally grown fruits) grilled chicken breast stuffed with mushroom and sage, and mahi mahi served on a bed of lentils for either lunch or dinner. Hot and cold soups, salads and fresh fruit sorbets all change according to season and availability of local produce. Lucca, another restaurant option, features gourmet Italian-Mediterranean, with menu options like herb-crusted rack of lamb and marinated red snapper. Main courses include pan-fried seafood, roasted Italian zucchini, and scaloppine di vitello al marsala. Additional options include Frida, a fine dining Mexican restaurant, and Piaf, a traditional French restaurant with gourmet entrees such as grilled duck breast with pineapple sauce. Portion-controlled spa cuisine is offered in the restaurants and in-suite dining. Grand Velas Riviera Nayarit offers exquisite dining in beautifully designed spaces, where the flavors of Mexico and various world cuisines come to life. The resort has revolutionized the luxury all-inclusive concept, offering fresh, creative meals in five restaurants, as well as premium domestic and imported spirits at all venues throughout the property. Breakfast 7:00 a.m. – 12:00 p.m.
Open from 11:00 a.m. - 7:00 p.m.